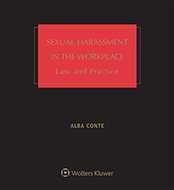 With over 35 years’ worth of publications, Alba Conte is an expert in sexual harassment, class actions, the legal rights of gays and lesbians, and court awarded attorney's fees. Her path to writing the first legal treatise on sexual harassment was paved with first-hand experience as a diner waitress. Inspired by the degradation she witnessed in the workplace, she went on to earn a degree in Women’s Studies at Douglass College of Rutgers University and a law degree at the University of Pennsylvania, where she was awarded the Alice Paul Award for her contribution to the legal status of women at the University with her publications. She continued her writing after law school, as the co-author of Newberg on Class Actions, and the author of Sexual Harassment in the Workplace: Law and Practice, The Legal Rights of Gays and Lesbians and Attorney Fee Awards, as the author of a number of legal articles, and as a contributing author to other works. She has been consulting and providing expert testimony in these areas for over 25 years, and her work has been cited a number of times by the United States Supreme Court, in cases including the discrimination class action Wal-mart Stores, Inc. v. Dukes, Amchem Products, Inc. v. Windsor, Comcast Corp. v. Behrend, Standard Fire Ins. Co. v. Knowles, Smith v. Bayer Corp., and Ortiz v. Fibreboard Corp., and by hundreds of other federal and state courts. Sexual Harassment in the Workplace, Fourth Edition, is a comprehensive guide that provides all the information you need to successfully litigate a sexual harassment claim. Buy now.